* Total number of reviews and star-ratings are based on data collected during the time period Gene's Refrigeration has been using the ReviewBuzz system and may not directly match the data found on each public review site. I'm very pleased with the the service. Matt was very knowledgeable, precise and efficient. We just bought a house and sold a house and Cody helped us with pluming projects in both.. He did a great job. He also took the time to put drop cloths on the floors which I really appreciated. I highly recommend him. 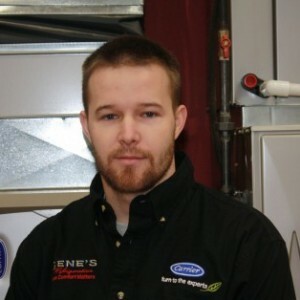 Matt has been our technician for several years. He is always extremely professional, informative regarding the services provided during the service calls, and courteus especially when having to explain the remedy for any esisting problem. We really do appreciate having such a reliable and skilled technician. Matt is top-notch! Mike arrived on time, was professional & courteous, and thorough with the service. Thanks Gene's... always a pleasure! Tom did an excellent job in helping me with a plumbing dishwasher problem. He was on time, very polite and patient in explaining everything to me. Thank you Gene's for selecting Tom to help with my problem. Had a new geothermal system installed in June. Got a system error this morning and the house was only 58F. 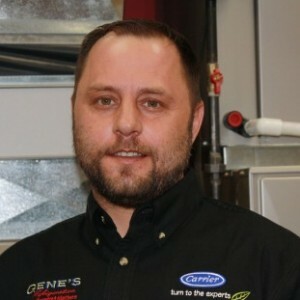 Called Gene's and they had a tech out to my house within the hour and fixed the problem efficiently. 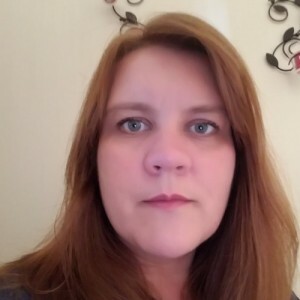 Everyone that I have had contact with has been professional, friendly and easy to work with. Would definitely recommend Gene's. Woke up to a cold house this morning, 8 deg outside. Checked a few things then called Gene’s. Got a quick call back and Matt promptly arrived about an hour later. Matt methodically checked things out and explained what he was looking for and what he found as he went through the process. Great fast professional service at at reasonable price. Matt did a great job identifying the problem with our thermostat and furnace. He explained what he was doing and what things he was looking for as he was going along. We're grateful as it will be in the negative temperatures tonight and we will be warm!! 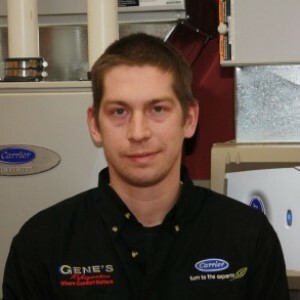 Matt is an extremely nice guy we would recommend to anyone looking for help with furnace issues. Prompt callback on a Sunday to help asses the situation over the phone and make recommendations. By next day the replacement water heater was installed to help us get our household back in order! About 24 hours from first call to completion! Technician took extra care coming in and out of the house to avoid tracking snow from outside and keep water from the bad tank off our floors. Fast, friendly, helpful service coupled with expertise. Will recommend! Fantastic job! Came out on a late call in nasty weather and fixed the problem immediately. Prompt, effective, and helpful. Answered all my questions along the way, and even provided advice on some plumbing questions unrelated to this job. Very happy with service! Josh arrived on time, was friendly and very professional. He inspected my furnace and provided the results, explaining everything very clearly and provided pictures of the problem. Very satisfied. January 4th was the second time Chris was at the house to inspect the furnace. He sold us an air conditioner last summer. Both times he was a true professional. We will ask for him in the future when we decide to rep[lace the furnace. Came home Friday night to the smell of burnt electronics, called Genes, Josh called me back in 10 min, showed up within 25min and replaced my motor, got the heat back on (19 degrees currently) in under 45min. I couldnt be happier with the service Josh did, and with Genes in general. They will be my goto hvac from now on! Thank you Josh, you saved the day and the weekend for me and my family! This is the first time I’ve had Mike to service my furnace! He was very very pleasant and performed the maintenance in a timely manner. Thanks, Mike! Good job! You explained the status of the furnace, what you checked and what we needed. We appreciate your thoroughness. Always friendly, great service and follow up! Josh was friendly, courteous and performed the service necessary. Your guys were great They were efficient and pleasant. I was already having problems with a very sick pet. They even helped me get him into the car as he weighs 70 pounds. Thank them again for me. They did a great job. Matt was courteous, professional and thorough. Really appreciated that he explained everything that he was doing during the inspection. Customer service is always a top priority at Gene's Refrigeration. Our BBB Membership rating is like a badge of honor as we continuously strive to provide the best experience for our clients.